Autism Spectrum Condition and their families. Golf Fore Kids proudly supports Camp AweSum, an organization that runs both youth and family camps designed and staffed specifically for children with an Autism Spectrum Disorder and their families, in conjunction with United Church Camps, Inc. Since 2005, Camp AweSum has provided a weeklong youth camp for ages 9-15. Located in the northwoods of Wisconsin, campers learn new skills, gain confidence, and develop lifelong friendships while safely experiencing a summer camp. Need has expanded camp to include three weeks of family camp to provide for more families affected by autism. Through our annual golf event, funds are raised to support the operation, as well as the extensive staff requirements, which include medical personnel, therapists, licensed teachers and paraprofessionals. Staff is specifically trained by Glenis Benson, Ph.D., autism consultant and educator. 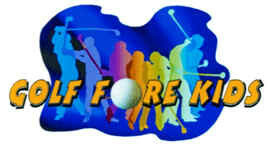 Golf Fore Kids also provides scholarship money for campers who require financial assistance in order to attend.